As the billboards display, it’s into Dodge, not outta Dodge. After a good nights sleep in Colby we headed down the 83 to Garden City. Kansas has a lot of fertile farming land and it’s no wonder they call it Plainsmen country as it is just that – very very flat. 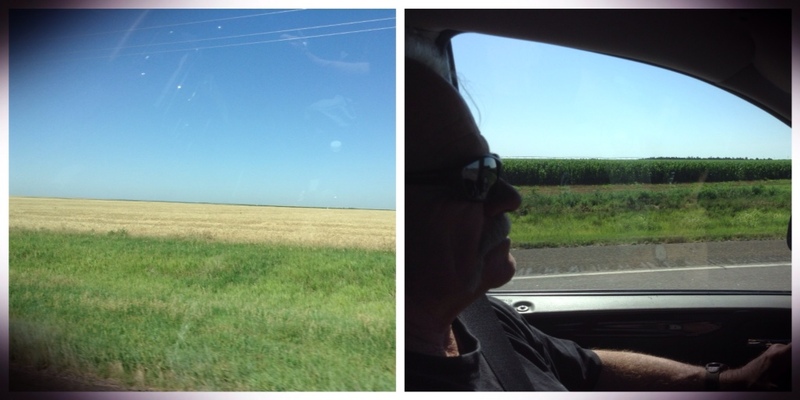 Full of corn fields and feed lots, and then more corn fields and oil derricks. On the outskirts of Garden City seems to be a large industrial hub and also a manufacturer for wind turbines. These things are huge when you see all the parts laying in a plant yard! Onward we went heading east to Dodge City arriving around lunchtime. 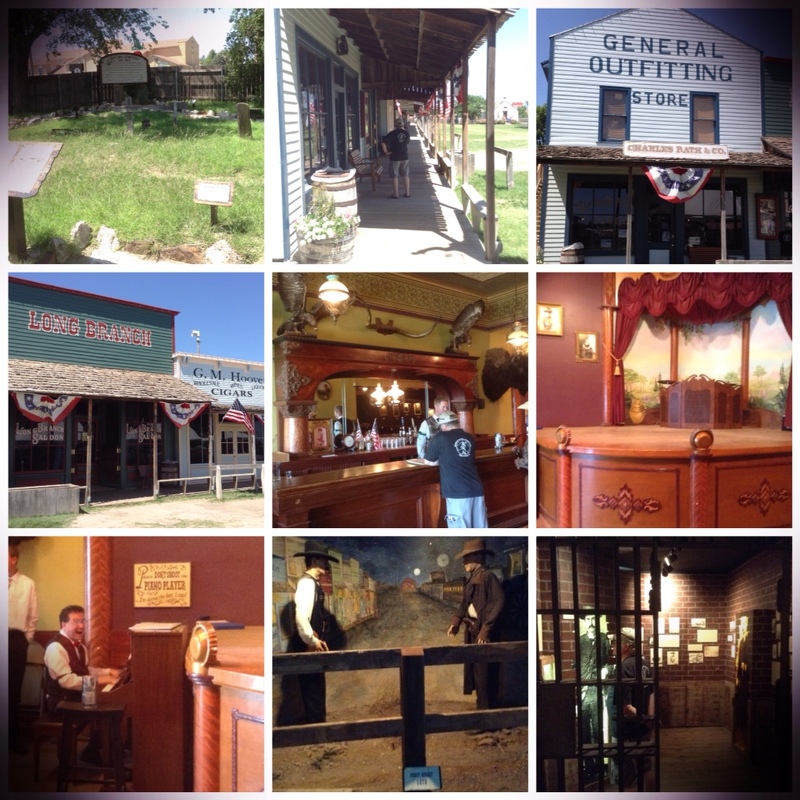 Dodge City town burnt down twice in the 1880’s, front street as depicted now at The Boot Hill Museum (some buildings or facades were moved to the site, the rest was replicated in 1958) is a replica of what it looked like back then, however was originally about 2 blocks away. 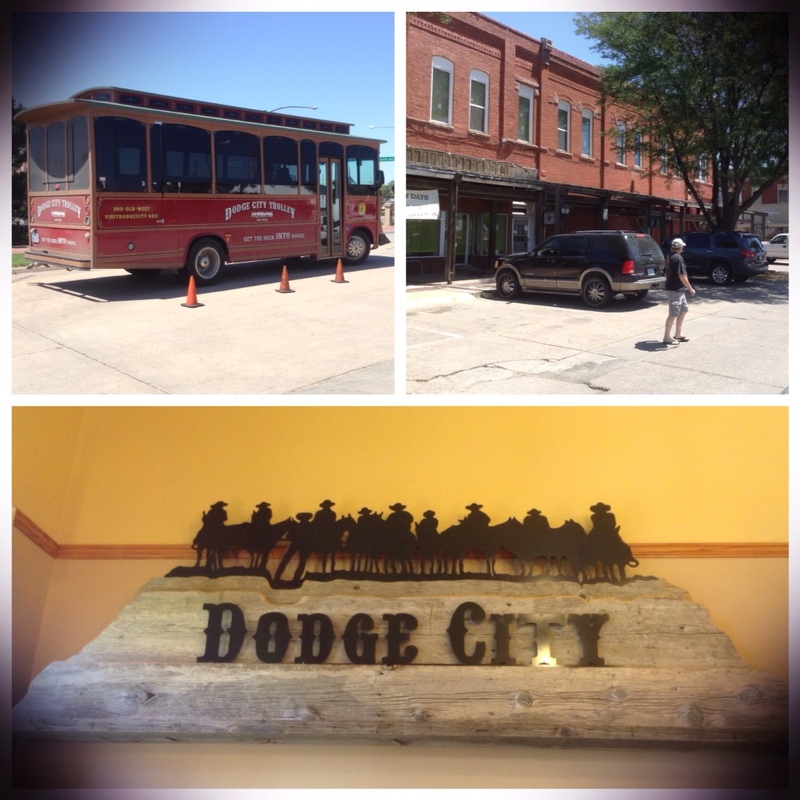 Dodge City was dubbed The Wickedest Little City in the west. Now it seems to hold the history and the spirit but is a booming cattle industry/meat producing town amongst corn, wheat and other crops. Other interesting facts to note, (there was so much information to take in on the Trolley Tour I couldn’t keep up!). Other than the famous and infamous cowboys, lawmen etc that travelled through and worked in Dodge City. 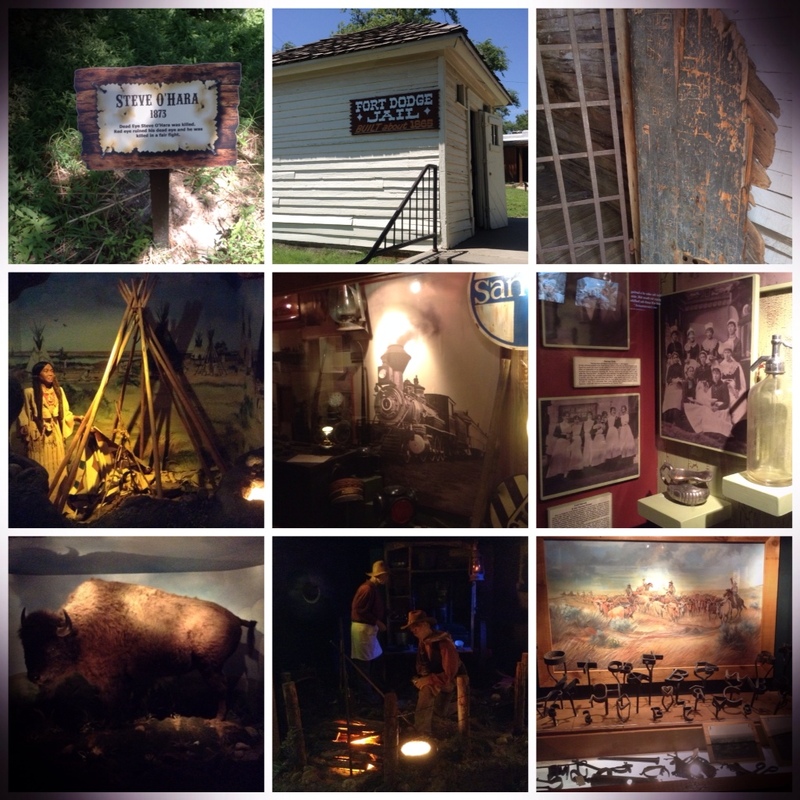 – Fort Dodge was established in 1865, originally a campground of sorts for wagons travelling the Santa Fe Trail. – George Hoover established the first saloon in Dodge. A sod hut erected in 1872, he later became Mayor. – First burial on Boot Hill was in 1872 (named Boot Hill because people were usually buried with their boots on) and the Alice Chambers, a dance hall girl reportedly to be the only woman to have been ‘planted’ on Boot Hill, however supposedly by natural causes. 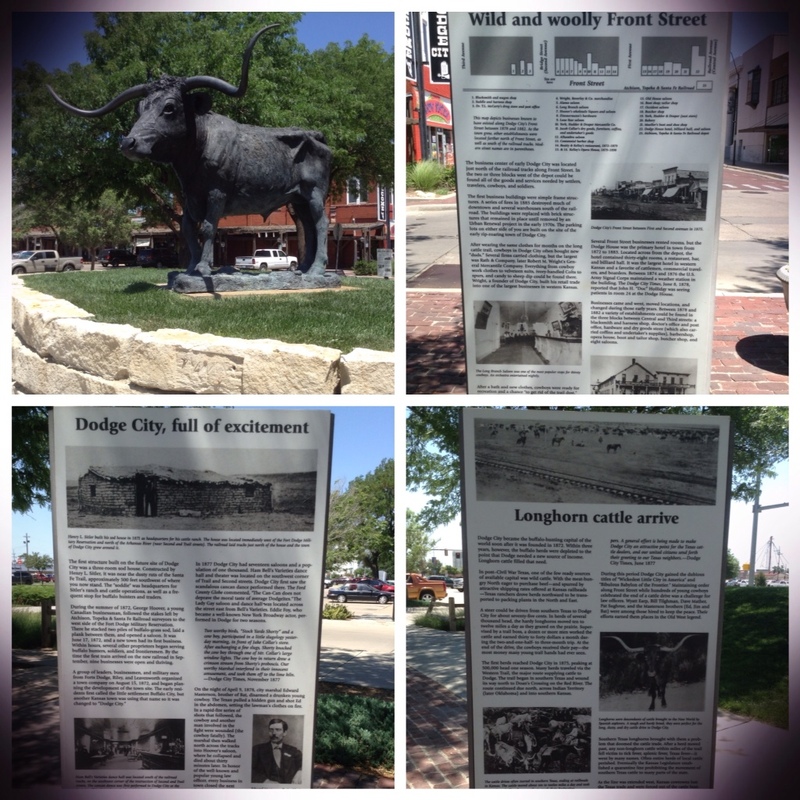 – Dodge City was known as queen of the cowtowns until the Kansas quarantine law came into effect in 1885 when the longhorns carried a tick disease that infected local cattle. – there were 2 front streets, the more ‘decorum’ North side where no firearms or dance halls were allowed (north of the tracks and on the side where the reproduction street is), and the South side which was the main business block of the 1880’s popular with buffalo hunters and cowboys, saloons, gunfights and ruckus! Separated during the times of Wyatt Earp and Bat Masterson trying to bring order to the city. – The Long Branch Saloon was the most popular. Owned and operated by Beeson and Harris, later made famous by the television series ‘Gunsmoke’. Regular entertainment was given by the Dodge City Cowboy Band and was known for gambling and fine whiskey. – between 1866 and 1872 it is said the population was around 1000 citizens that reportedly consumed enough alcohol to the equivalent of 150 miles/ year!!! 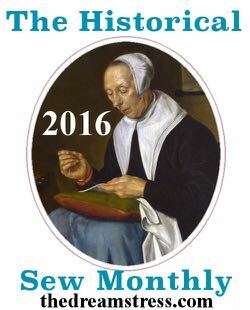 – it was also known during that time that only 13 people were Christians. Gospel Hill becoming know for it’s churches, the St Cornelius Episcopal church still has the original building from 1891 the stained glass windows are still original. The Presbyterian church that is there now is built on the original site, the gable being where the first church was and the bell in the courtyard is from the original Presbyterian Church. – The Mueller-Schmidt house is original and listed as a historic landmark today and you can take tours through it. – The Santa Fe Depot once a famed Harvey Hotel was one of the finest depots. The building at the end of the depot is the original Harvey girls dormitory. – The first Marshall for Dodge was in 1875. The famous Wyatt Earp was an assistant Marshall or Deputy in 1877 and had a quite way of enforcing law. Bat Masterson also embodied the colourful tales of the Wild West. He was one of the first citizens buffalo hunting with his brother and a friend. Bat’s brother Ed was a Marshall which was a short tenure when he was shot by a cowboy in a saloon as he attempted an arrest. – Butter & Egg Rd was originally used as a street for farmers to bring butter and eggs into town to be sold. The county here wanted to change it for 911 upgrade purposes to Laryette but the community got together and protested keeping the name of the road as it’s original. It sits out in amongst the feedlot heartland. – There are huge feedlots here with up to 1.3million cows capability. 85% cow hides are used for leather goods like shoes and car upholstery. Nothing is wasted, even the manure is used for fertiliser on other crops. 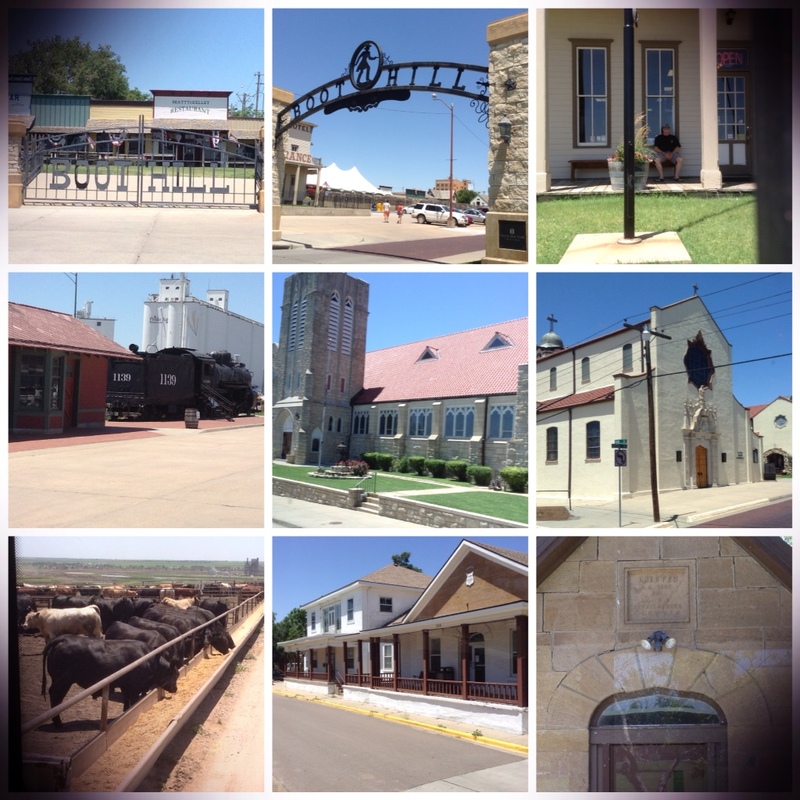 – Dodge City is one of the richest wheat and cattle industries in the world. – When Francisco Vasquez de Coronado came through on his quest for gold in 1541 when he gave up looking for the City of Gold they left the horses here which in part is how the Indians became proficient horsemen and they became the ride for cowboys to navigate the plains. – 3 years of intense buffalo hinting nearly eliminated the buffalo by the end of the late 1870’s. Prior to the hunting a buffalo herd could be a mile long and one and a half miles in width. – at Fort Dodge, the Custom House original building was the original commanding officers quarters. The wooden building housed military men. – The museum library is situated in the original store house. – The quarters for the men, two stone barracks and one of Adobe. All now sits inside the Military Kansas Veterans and is a state soldiers home, like a retirement home. – 1500 trucks a day service business in Dodge, for meat processing and other major manufacturers. – There are two major meat processing plants in Dodge, employing around 2 thousand people each. The Winter Livestock lots is the biggest privately owned and runs auctions every Wednesday. Phew! A history bombardment, fabulous! Hot day too, 106F/41C. Thoroughly enjoyed it. We decided to move on at around 4.40pm and not do the wax museum. Tonight we spend in Pratt, KS, homeward bound to Edmond, OK tomorrow. See you on the trail again next week as we head to Kentucky! Yee haa! 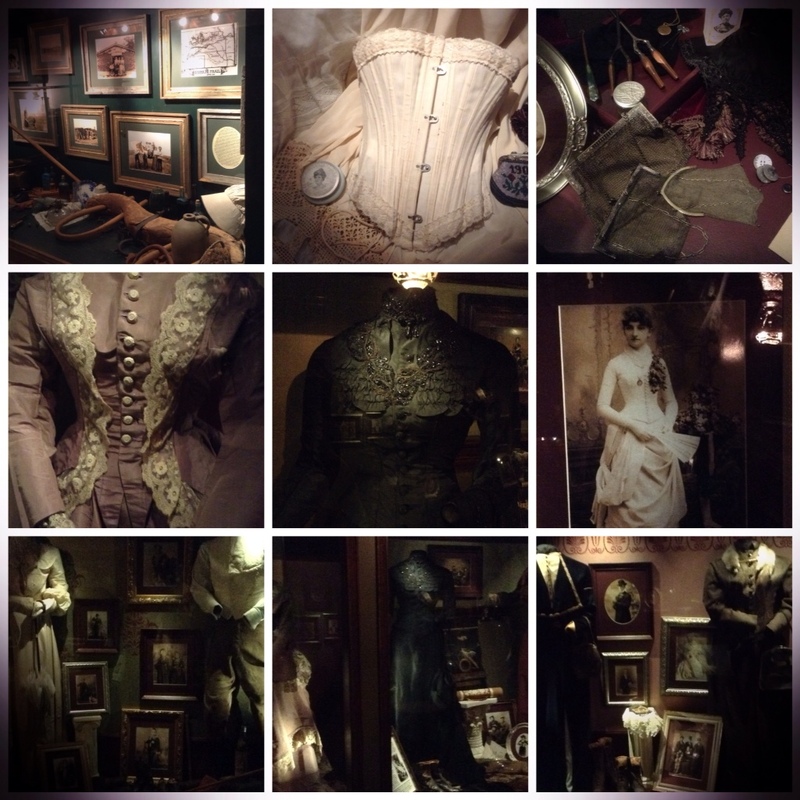 This entry was posted in Love My Life and tagged Boot Hill, Dodge City, harvey house, Kansas, outlaws, Plainsmen Country, Railways, USTrip, world heritage. Bookmark the permalink.